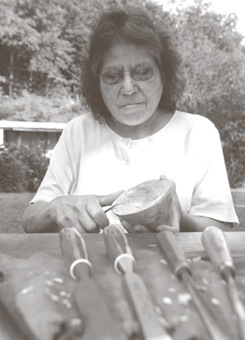 As a result of agricultural land clearing, dam-building projects, modern-era land development and other circumstances over the past century or more, the natural resources used by Cherokee artisans for centuries are becoming scarce on the Qualla Boundary and in other local areas. Quality river cane (Arundinaria gigantea) and white oak (Quercus alba) used to make baskets are very difficult to find locally, and so is the clay that Cherokee potters need. Carvers have resource problems as well because the wood and stone they need is often in areas with restricted access. Preserve and protect the uniqueness of Cherokee traditional art and natural resources for future generations. Reclaim Cherokee youths' interest in cultural heritage using educational methods that promote Cherokee identity and the development of positive cultural esteem. Expand and disseminate public knowledge about the protection and preservation of cultural artisan resources. Initially RTCAR will focus on basket making materials and associated dye plants, clay for potters and materials for carvers. The project will eventually expand to include culturally significant edible and medicinal plant resources. Teaching Cherokee youth about the Eastern Band's artistic traditions is another aspect of RTCAR.